We consider the decentralized scheduling of a large number of urban traffic lights. We investigate factors determining system performance, in particular, the length of the traffic light cycle and the proportion of green time allocated to each junction. We study the effect of the length of the traffic cycle on the stability region a urban traffic network. We derive a simple square-root cycle length rule which is optimal for certain road traffic junctions. We prove the maximal stability of a road network under a proportional fair or P0 control scheme. Further, we support of analysis through a simulation analysis of our policy on the Melbourne CBD urban road network. Kovacs, P, Le, T. (Tung), Núñez Queija, R, Vu, H. (Hai), & Walton, N. (2016). 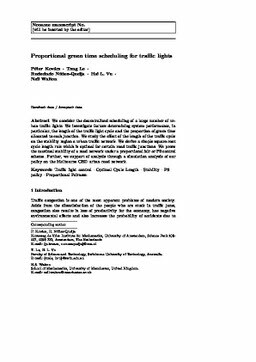 Proportional green time scheduling for traffic lights.